PC Specialist pairs a Core i5-9600K with Nvidia's GTX 1660 Ti in this £1,200 gaming rig. The first in-house ROG chassis under the microscope. One due a lot sooner than the other. 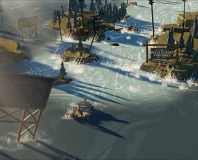 A team of former Bioshock developers has announced survival sim The Flame in the Flood and launched a Kickstarter project. Irrational Games and 2K have announced a new BioShock game, BioShock Infinite. BioShock 2 has the same widescreen issue as the first game - cropping the 4:3 image down to suit 16:9 screens. 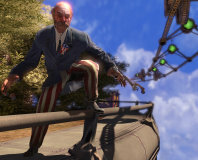 2K Games has confirmed that BioShock 2 will have no dedicated server support, or LAN games. 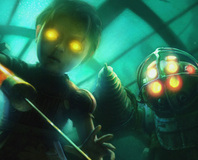 BioShock downloadable content on the way? Ken Levine speaks about how he wants to see the BioShock universe expand in a new interview, hinting that DLC could play a pivotal role. The BioShock Activation Revoke Tool has been officially released and should hopefully fix a lot of the copy protection problems that people have had with the game. In a recent interview Ken Levine has admitted that the multiple endings to BioShock weren't his idea and that he didn't want to do them. So, just what did he have in mind? You asked me to investigate and now I've got the answers. The truth about the copy protection and widescreen issues in BioShock. 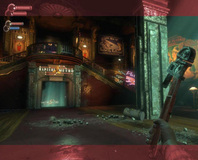 BioShock widescreen cropping got you down? Well then here, help yourself to the Levine-Apology Plasmid! BioShock: examined, dissected and documented in all of its glory. We've split the coverage of this industry-defining game into two pieces and here's the first instalment for Xbox 360 and PC. Jack Thompson has been oddly quiet lately, but now he's back with a vengence and has filed a complaint with the FTC about the advertising campaign for BioShock. Not got an Xbox 360, but still want the best game since Jenga? Then thank the lords that the PC demo of BioShock is coming your way later tonight! 2K Boston is making the official sixty-page Bioshock artbook, which was originally planned to be in the Collectors Edition, available for free download. When we previewed Bioshock, even we had to grumpily admit it played well on 360. Now Xbox owners can try it themselves. The rest of us will have to setlle with the new trailer. 2K games has released the hardware requirements for the upcoming Bioshock. Handy for gamers who want to be ready for what is surely going to be this year's biggest game. Elizabeth Tobey, a 2K Games Community Manager, has revealed that BioShock's release date has been pushed back to late August from the original June release expectations. An official community Q&A for BioShock has revealed that the title will not have a multiplayer component.